Always a good question… leaving school I entered retail management. After a couple of years I realised that it really wasn’t for me anymore. I picked a university course with a broad approach to environment and studies, but perhaps a more focussed degree may have been a better choice with hindsight. Whilst studying, we had to undertake work experience during our summer months recess. I was offered an opportunity to work at the Institute of Terrestrial Ecology near Wareham, Dorset. I was introduced to the world of Lepidoptera and my first experience of ecology, catching butterflies, marking and releasing. This was in relation to the Chalkhill Blue butterfly and the restoration and mitigation works at Twyford Down either side of the M3 Winchester, Hampshire. We were trying to establish if the separate populations across the site, including St Catherine’s Hill, were meeting and, in particular, crossing the motorway. I was amazed at the intricacy and intimacy of the relationships I was discovering between flora and fauna groups. This led to further work at the Institute and Butterfly Conservation, volunteering roles in the region, travelling around the UK surveying and mapping sites and being involved in The Large Blue re-introduction programme too. The best part about working with summer species is that you may only be surveying when the weather is conducive to them flying. Work can be hard to find throughout the year in and around ecology and surveying as some readers may know. In early 2001 I saw an advert for a graduate assistant role at a National Grid Education centre for an academic year. I got the job and soon discovered I enjoyed showing children, and adults, the marvel of discovering what lives in our woods, meadows and ponds. Returning to Dorset I worked in education centres, operated as a self-employed tutor for a while, broadening and adding to my skill set with qualifications away from the environment sector. In Nov 2010 I started work for Hampshire and Isle of Wight Wildlife Trust as an Education officer, returning to North Hampshire where my education profession had begun. Within the first week I was attending a Forest School leader level 3 training course and I have to say that changed my outlook, on everything, it was inspirational! Gaining a greater understanding on how we learn and discovering a variety of teaching methods was new to me and has led onto further reading and personal development. Realising there was a large element of practical skills and enabling time outdoors in all seasons was fantastic. I worked with the Trust for 5 years and I developed a lot in that time with my focus of outdoor education and experiences on offer, moving away from very formal education provision with worksheets and expectations of outcomes and objectives, to play and physical activity focussed Forest School provision. I also undertook my level 4 CTLLs to deliver and assist with Forest School training and First Aid training. Being self-employed, much time is spent dealing with business admin and corresponding with clients. My work is bespoke and tailored to their requirements, especially one-off sessions, which may include school grounds consultations for wildlife benefit and outdoor education opportunities and delivering CPD sessions focussing on school ground use for outdoor education or Forest School based activities. Forest School programmes by their very nature are long term programmes, so during sessions I am scaffolding the learning, where required and as requested. Otherwise I may be observing participant’s activities and play to ensure I can fully support their development and where necessary satisfy any future reasonable requests. 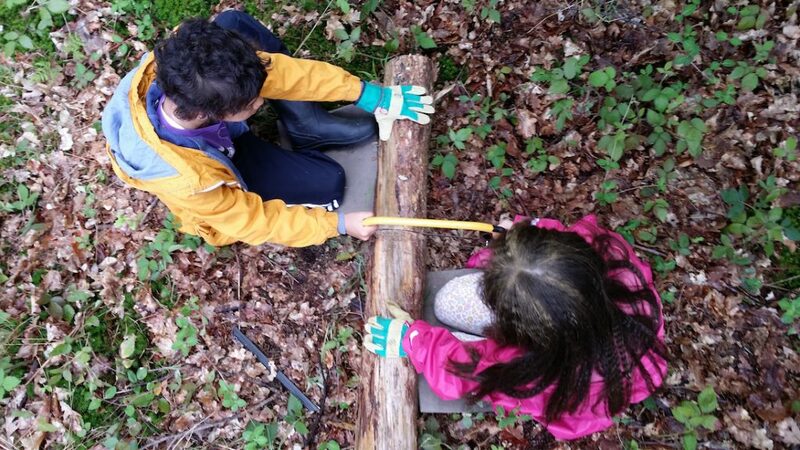 In each Forest School programme, the group, each individual, and each session is different. Sessions may revolve around individual free play, fire lighting and cooking (for me a fire needs to have a purpose), tool use, tree climbing, physical activities such as swings, rope ladders, slack-lines, tight ropes, cargo nets or tree platforms. I supply the equipment but from thereon it is up to the learners to request activities once they have been introduced and they know what is on offer. 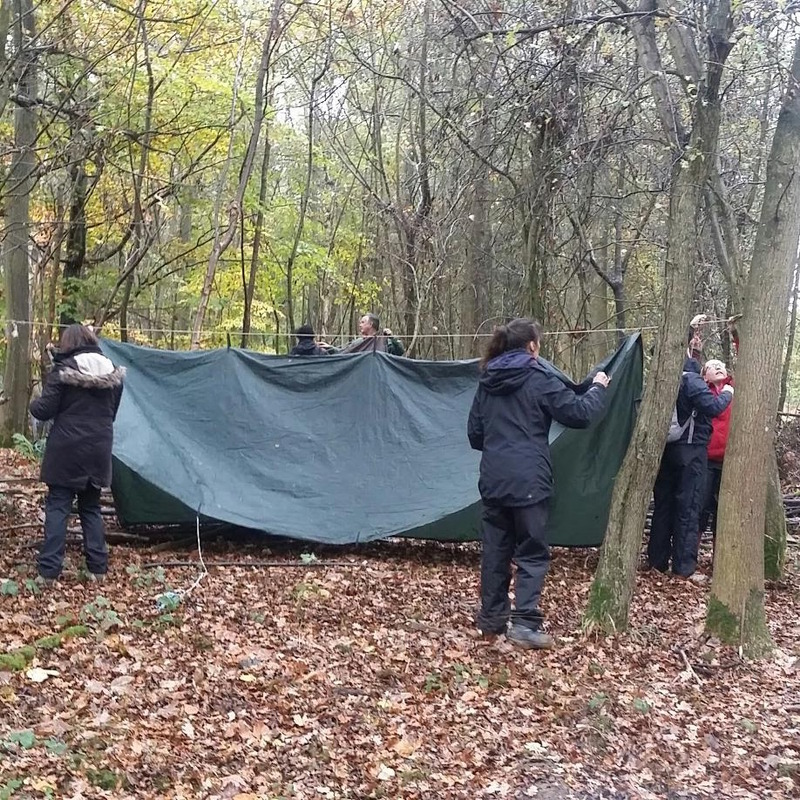 We have seen fantastic dens, requests for woodland feasts, dressing up, learners pushing themselves to climb ladders and discover their limits and beyond, amongst many other activities. By allowing learners to make decisions about their activities and time use, we are assisting their personal development, thinking, communications skills, co-operative play, gross and fine motor skills, language development and understanding of being outside in an immersive environment and this really is the tip of the iceberg for the benefits of outdoor education and Forest school provision. To deliver Forest School and call it so, I believe you must have a Level 3 qualification as a Forest School leader. It supplies an understanding of the ethos of Forest School and more. Forest School is a small element of outdoor learning which is a broad spectrum of opportunities. That said, there is no reason why you cannot offer similar opportunities but not call it Forest School if you do not hold that qualification. So, having a little knowledge of native species and habitats is very useful to understand our countryside and woodlands. It is not necessary to know every species but the basics upon which to build your knowledge. Also, the ability to say to someone who asks, ‘I’m unsure, let’s look it up in a book or ID guide’. Allied with some experience of working outdoors with a range of learner’s ages and abilities. Additionally, practical skills such as knots tying, fire lighting, green wood use and making items from wood, but these are all skills which will be encountered as part of your qualification and can lead to a lifetime of personal development. I now like to dabble with whittling knives, attempting to make useful cutlery. – Working outdoors in some very special places and woodlands throughout the year and observing and acknowledging the seasonal changes. – Meeting some wonderful entertaining learners and witnessing their personal journeys of learning or play development. I thoroughly enjoying passing on my knowledge and skills to enable others to flourish, discover and develop. 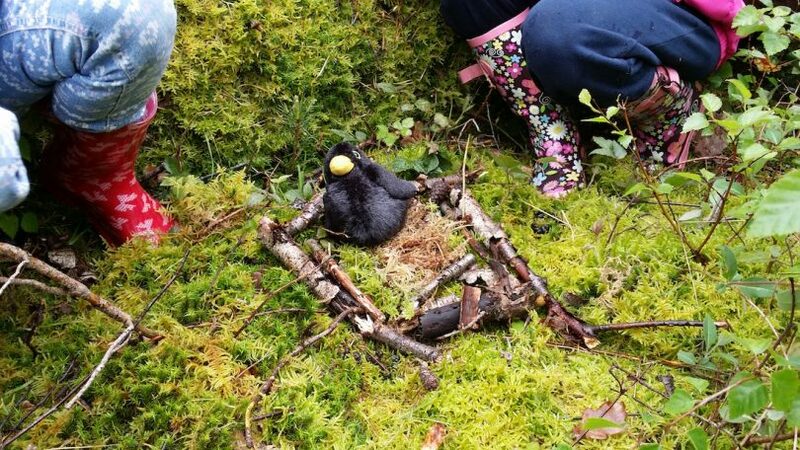 Be that adults attending CPD courses, adults attending a Forest School training course, Forest School participants during a programme or children discovering creatures during a single session in the countryside. On a Forest School training programme over the year as a tutor you get to know the learners and to witness them, sometimes dramatically, change their personal approach to outdoor learning. More than once this has mirrored my own change from formal delivery to understanding the importance of play for a Forest School participant’s personal development. – Wet kit, day in day out! – Drying and keeping kit clean. It can be difficult to sustain business and there has been a noticeable decline in business over the past few years as budgets across the economy and public sector have shrunk. Additional services such as Forest School and outdoor provision are very often the first to be cut as they are not seen as core and necessary. Frequently for some participants, this maybe the only real extended outdoor time they have access to, giving an important and welcome break from the four walls of school and home. Look for a local provider, have a chat, see if you can volunteer and get some experience, which may then lead to paid roles as an assistant. Get in touch with your local Forest School regional group to meet others. We all have similar experiences and are supportive groups. Lots of advice can be found HERE. About the Author: Adrian Goodhand has been involved with ecology and species conservation through; surveys, research and education for over 20 years. A Forest School level 3 practitioner since 2010 and trainer since 2013. A Forest School training tutor for several organisations. He is a member of the Forest School Association (FSA) and the Dorset representative for the Forest School Association South West (FSA) affiliated group. Owner of his own business since 2015. Additionally; a Trainer Assessor for RLSS National Pool Lifeguard Qualification and Swimming Teachers Association First Aid trainer, BSAC Snorkel Instructor, qualified swimming teacher and Bikeability instructor amongst several further outdoor qualifications. Away from work Adrian enjoys running trail marathons and ultras, exploring Dorset and further afield in the UK whilst sleeping under the stars when weather allows. You can find a link to Adrian’s website HERE.